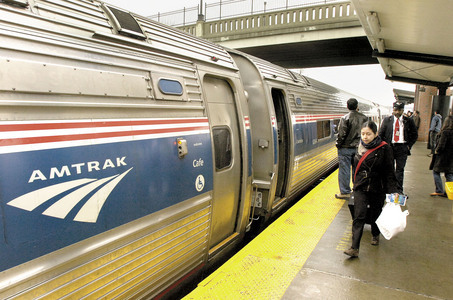 If your New Year’s Resolution is to travel more in 2018, Amtrak is doing its part by offering customers its “Northeast Regional 3 Day Sale” for travel between Monday, Feb. 5 and Thursday, Mar. 15, including holiday travel during President’s Day Weekend. Starting Tuesday, Jan. 16 through Thursday, Jan. 18, customers can receive discounts on one-way fares to visit the most popular cities in the Northeast, including New York City, Boston, Philadelphia, Washington, D.C., and more, with no blackout dates. The sale is only available at Amtrak.com, and all prices will be automatically discounted from the standard fare price. No discount code is needed; prices are as shown and can’t be combined with other discount codes. Below are some of the special prices available during the Northeast Regional Flash Sale. All prices reflect the cost of each trip in either direction. Amtrak offers large spacious seats with wide, comfortable reclining seats and ample legroom for comfort, as well as free Wi-Fi, the freedom to use phones and electronic devices at all times (no “airplane mode”), the ability to travel with small pets on many trains, no middle seat, and one of the most generous baggage policies in the travel industry. Sale prices are available exclusively for one-way Coach Class fares and upgrades to Business Class are not permitted. The offer does not include travel to or from any intermediate cities. Space is limited as sale prices are not available on all trains or at all times. Once purchased, tickets are non-refundable. Others restrictions may apply.